It is a recommended practice when you have multiple Exchange servers providing high availability for client access namespaces that you configure the same SSL certificate on each of those Exchange servers. 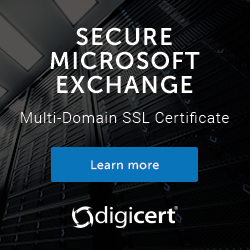 After you've configured the SSL certificate on the first Exchange 2016 server you can export and import it to the remaining servers that need it installed. In this tutorial I'll walk you through how to export the SSL certificate from a server, and then how to import it into one or more additional servers. Note that you can use this procedure to export and import SSL certificates between Exchange 2013 and Exchange 2016 servers as well. In the Exchange Admin Center navigate to servers -> certificates, and select the server and certificate you want to export. Enter the UNC path to save the exported certificate to, and a password to protect it. Click OK and wait for the export to complete. Now start a new certificate import. It doesn't matter at this step which of the servers or certificates you've selected in the EAC first. Enter the same UNC path and password you used earlier. Select one or more Exchange servers to import the SSL certificate to. After importing the SSL certificate to a new server you can then simply enable the certificate for Exchange services.